Uncertainty permeated the Michigan football team's spring camp last year, as the program transitioned to a new coaching staff and changed schemes on both sides of the ball. This year, it's optimism after the Wolverines' 11-2 season and Sugar Bowl victory. But despite all that has changed in the past 12 months, one thing has held constant: Coach Brady Hoke's concern about the health and depth of his offensive and defensive lines. 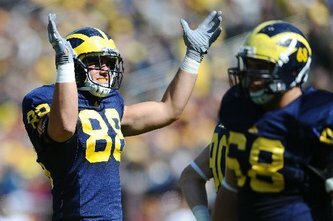 "We got very lucky a year ago, on both sides of the ball, in staying pretty healthy," Hoke told AnnArbor.com on Tuesday during an interview in his Schembechler Hall office. He knocked on the wood of the coffee table in front of him as he said it. The Wolverines had only eight scholarship offensive linemen last year, roughly half what Hoke desires, and played mostly with a rotation of six on defense. Now, Michigan must address the departures of All-American center David Molk and right tackle Mark Huyge, as well as defensive linemen Mike Martin, Will Heininger and Ryan Van Bergen. "And we still don't have nearly enough linemen in the program," Hoke lamented. To shore up those issues, Hoke said he is making several personnel changes as the Wolverines kick off their 14-practice spring camp Saturday. The most prominent of those moves impacts redshirt senior Ricky Barnum, the former starting left guard who now will receive the first crack at replacing the Rimington Award-winning Molk at center. Barnum played in four games at left guard last year, and started three. He was strong when he was in there, but missed the first game of the season because of a suspension and much of the Big Ten season with two balky ankles. He did not play in the Sugar Bowl. Returning centers Rocko Khoury, a senior, and Jack Miller, a redshirt freshman, also will be given a shot to win the job. Meantime, Hoke said junior Michael Schofield, who filled in for Barnum at left guard, will slide back to his natural position of right tackle. He can play anywhere but center on the line, but his 6-foot-7, 299-pound frame makes him an ideal fit at tackle. It appears the most wide-open job could be the vacated left guard position. When asked who were candidates for it, Hoke first mentioned Elliott Mealer, a senior who has played sparingly in his career. "His opportunity, his time has come," Hoke said. Mealer's main competition in spring camp will be Chris Bryant, a redshirt freshman who was lauded for his performance in bowl practices last year. Hoke stressed that, no matter what happens, his goal is to put the five best players on the field. That means it is possible the loser of the center battle -- be it Barnum, Khoury or Miller -- moves to guard. Or, a true freshman could make his case in the summer. Kyle Kalis, a five-star prospect from Ohio, is believed to be the leader among that group. "We’ll go through spring and kind of have an idea, and then in June, the young guys get in here and start lifting and all that," Hoke said. "We’ll know probably the first two weeks of August who is going to help us, and who’s not." Junior Taylor Lewan is back at left tackle, and Patrick Omameh at right guard. Moves on the defensive line include Craig Roh (88) moving from weak-side to strong-side end. On the defensive side of the ball, the top two weak-side defensive ends are on the move. Hoke said senior Craig Roh has moved to strong-side end, and Jibreel Black will begin the spring at tackle. "We think we might be a little more quicker than we were," Hoke said of moving Black inside. "But, it’s a lot of heavy hitting and you got to find out where they’re at." Sophomores Frank Clark and Brennen Beyer, the latter of whom played linebacker last year, are expected to compete for Roh's job at weak-side end. Joining Black at tackle will be Will Campbell, a highly touted recruit from Detroit who is entering his senior season. He will be one of the camp's most scrutinized players. "Will Campbell, we think, has made a lot of improvements in his conditioning and all those things, but he’s got to be more productive at the point of attack," Hoke said. Junior Quinton Washington also is expected to factor in at tackle, and so too could an incoming freshman. Five-star, 320-pounder Ondre Pipkins is expected to be in the mix. "You’re going to have young guys competing," Hoke said. "It’s going to be interesting." Hoke said he does not expect defensive tackle Nathan Brink "to do much" in spring camp as he recovers from offseason surgery. Brink did not play in the Sugar Bowl after suffering the undisclosed injury. "Other than that, everybody else should be OK," Hoke said. When asked if any players have left the program since the conclusion of last season, Hoke said he would "address that issue Friday" and declined further comment. His first news conference of spring camp is scheduled for noon Friday at Schembechler Hall. He did say he doesn't expect to incur any academic problems. The only known departures since the end of the 2011 season are receiver Darryl Stonum, who was dismissed in January, and reserve linebacker Isaiah Bell. Neither played last season, although Stonum was expected to start next year. Hoke didn't address whether any redshirt juniors would forgo a fifth year. Hoke said linebacker Jordan Paskorz and defensive end Chris Eddins are moving to tight end "to get an on-the-line guy who can block a five-tech, or move a six-tech." Both could vie for time in the fall after the departure of starters Kevin Koger and Steve Watson. "In this offense, tight ends, because we’re not a true spread team, and won’t be, we got to have a guy like Kevin Koger who can block at the point of attack and do those things," Hoke said. Hoke was reluctant to name a leader for the starting spot at the position. When asked about redshirt senior Brandon Moore, the presumed leader, he said Moore "is a guy who we expect to get better from the fall, to the spring. ... It could be him (who starts)." When asked about a true freshman such as A.J. Williams or Devin Funchess starting, Hoke said, "Maybe. There is no entitlement." Team 133 has a lot of shoes to fill. Ideally our depth guys will step up and we will improve, but we have to be prepared for a season that still reflects rebuilding. Hoke has pulled in some great new talent, who are also young men of character, and he and his staff has demonstrated that great coaching can take players to a level that no one, other than the team themselves, expected. They all have a second season with the same coaches, time to internalize the offensive and defensive schemes. Our prospects are bright, but the 2012 schedule is tougher, and we are still thin in critical positions. I would love if they end up playing for the Big Ten Championship, but as long as they continue to mature as a team, to improve their proficiency, and play every second of every minute of every game they'll have more than met my expectations, anything more is gravy. Wed, Mar 14, 2012 : 8 p.m. Wed, Mar 14, 2012 : 9:07 p.m. Yes, yrue. That is college football. We will have some good surprises with new young talent. I am just saying that it is NOT a &quot;lock&quot; to match the 2011 win total. Wed, Mar 14, 2012 : 8:06 p.m.
you are assuming that Michigan will remain stagnant as well. Team 133 will be much different than team 132. Wed, Mar 14, 2012 : 3:18 p.m. I'm a big fan of Elliott Mealer, at 6&quot;5' 310 he is much bigger than barnum and heavier than schofield I'd be ok with Chris Bryant or Elliott Mealer starting at left guard. Wed, Mar 14, 2012 : 5:59 p.m.
Mealer is a lot like Campbell. Both are very big and were highly ranked recruits. Both have contributed very little. it would be huge if they could both turn it on their senior years. Wed, Mar 14, 2012 : 2:13 p.m. The optimism that permeates the UM football program is well deserved. Thanks to David Brandon for hiring the right guy. The progress is obvious and tangible. Records speak for themselves. The high level of recruit that Coach Hoke is bringing to UM is impressive in their character as well as physical stature. Glory days ahead! Wed, Mar 14, 2012 : 1:30 p.m. Unless something has changed in the last year, I'm pretty sure Paskorz is on scholarship. The recruiting sites all list him as being a part of the 2010 class of recruits. Yep, you're right evenyoubrutus. I fixed that. Thanks for pointing it out. Wed, Mar 14, 2012 : 11 a.m.
We're seeing the beginning of Team 133 taking shape. I have no doubt that &quot;133&quot; is going to be better, more effective overall. Every year the question is who's going to replace departed seniors from last year? At least this year, there seems to be some added depth and we know these coaches can produce outstanding on-field performance. Far better than in quite a few years now. Also, it seems likely that the new senior players (all of Denard's class) will produce some team leadership and will make their final season their best one. I still can't shake the feeling of relief, thinking of &quot;that other period&quot; when progress was invisible. I think the Wolverines are on the Up Escalator and will stay on it.